Horizontal Bitumen Storage Tank - GlobeCore Bitumen Emulsion. Own storage and preparation of bitumen has a number of advantages for a business. Owning bitumen storage and boilers allows one to create and replenish material stock without fear of market fluctuations and supply disruptions. There are various types of bitumen storage and heating systems. GlobeCore offers equipment optimally adapted to your business and your technology process. Bitumen storage is an important part of any bitumen facility. With its heating system, it can store both asphalt emulsion and bitumen. The insulated bitumen storage tank is made of 6 mm thick metal sheets. The engineers of GlobeCore have developed a number of solutions specific for the task at hand. Depending on the type of technology process and materials used, the company will offer the most efficient and the least costly option. For instance, the storage tank can be equipped with a heating system of customer choice, be it gas or diesel burner, steam of hot oil heat exchangers. For an oil heating system, the company offers an MTG 400 000 kcal heat generator or a special boiler. 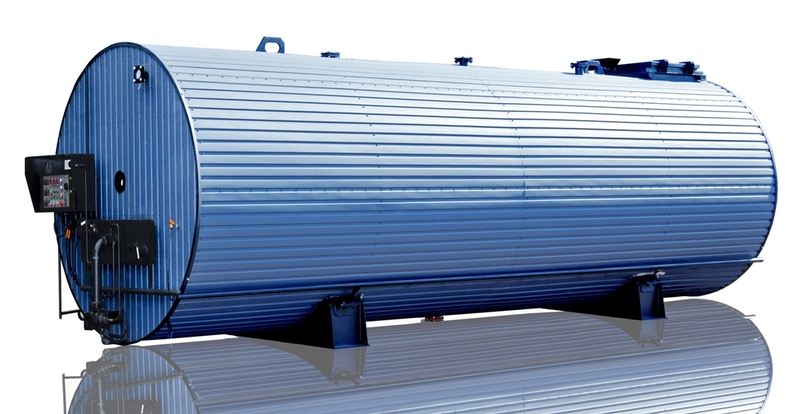 The horizontal storage tank has the advantage of higher capacity. All products are made at our factory, pass quality assurance tests and are delivered to our customers worldwide. Our engineers, highly experienced in the field of mechanical engineering, can address the customer’s need to create and implement solutions of any complexity. There are two general types of horizontal storage tank design, depending on the heating system chosen. Storage volume depends on the presence or absence of heating burners and varies from 28 to 30 cubic meters. However, a more popular solution is to use oil for heating. It is an efficient and environmentally friendly method, which ensures preservation of all essential qualities of bitumen. Oil heating is just as, if not more efficient than burners, but is much smoother. The temperature of the tubes through which the oil circulates does not exceed bitumen boiling point, and this prevents bitumen overheating. A single oil heater can generate enough heat to service at least three or four horizontal bitumen storage tanks. If gas burner heating is used, the condition of bitumen inside the storage tank must be monitored carefully to avoid overheating the bitumen until sludge forms in the tank, or cooling of bitumen to the point when it solidifies, which will require cleaning of the tank. Besides, the tank must never be completely drained, as there should always be enough bitumen to at least cover the flame tubes. Despite the shortcomings, this type of heating has also found its uses with companies which prefer heating by burning gas or other fuels. The design department and engineers of GlobeCore constantly improve the technology, eliminating shortcomings, introducing modern technologies and devices. Since asphalt is a rather viscous substance, the storage tank is equipped with special horizontal agitators, which mix the hot and cold layers of bitumen inside the tank. Another distinction of our product is that it is designed to fit inside a standard maritime shipping container, so that it can easily be delivered anywhere in the world. If the storage container is equipped with gas burner heaters, these can be removed for separate transportation. After shipment, the burners are again attached to the tank according to the diagrams included in the operation manuals. The product may optionally be equipped with a bitumen supply pump assembly, also made by GlobeCore. In general, the customer can order a complete bitumen handling solution, appropriately designed, tested and certified to meet the customer’s needs. Must the storage tank be filled at all times? This depends on the heating system installed. If oil heating is installed, the tank can be drained and refilled at will. If the tank is equipped with a burner, bitumen must not be drained past a certain level to prevent overheating or even fire. How is the system controlled and what are the safety measures? overflow sensor (at the top of the tank). When triggered, the high level sensor shuts off the pump feeding the material into the bitumen tank. For emergencies, there are special openings for quick drainage of bitumen. How is the system shipped to the customer? The system is partially disassembled for shipping. Once the unit is delivered, our engineers arrive for installation and commissioning. The ladders used for installation are removable. The warranty period is 12 months from date of shipment from the supplier’s warehouse. The manufacturer guarantees stable operation of the product if the consumer observes installation, operation, maintenance, transportation and storage rules specified in the manual. How many operators are necessary for operation of the system? The minimum number of operators is two people.